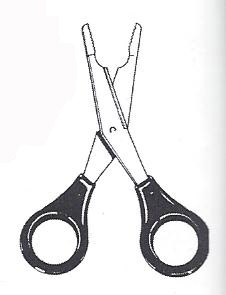 DANIELSON FISHING SCISSORS These stainless steel scissors have large plastic finger loops that are comfortable and easy to use. The efficient design of this great utensil has a serrated plier nose to crimp split shot and work as a hook remover. It's small enouth for a tackle box or vest pocket. One per pack.